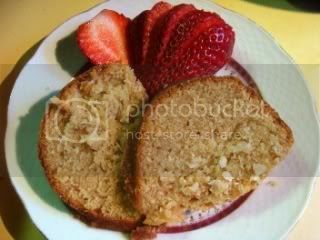 Bryanna Clark Grogan’s Vegan Feast Kitchen/ 21st Century Table: VEGAN LEMON-COCONUT "POUND CAKE"-- LESS FAT, BUT YOU'D NEVER GUESS! 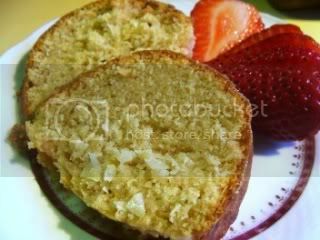 VEGAN LEMON-COCONUT "POUND CAKE"-- LESS FAT, BUT YOU'D NEVER GUESS! I haven't been doing desserts lately because DH and I are on the Weight Watchers' Core Plan, but I was inspired to develop this recipe for two reasons-- #1, a friend was asking for a vegan pound cake recipe that was rich, like the original; and #2, I had just read an article in the Jan. 2007 issue of Fine Cooking magazine, which was about modernizing the traditional pound cake so that it would not be so dry and "sturdy", as the author, Nicole Rees,author of Baking Unplugged, put it. 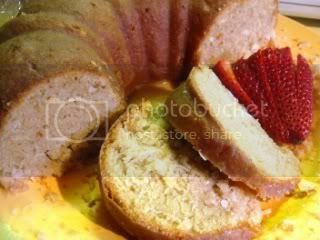 I had previously developed a "heart-healthy" pound cake that was very low in fat. I wanted this one to be richer, but not as high in fat as traditional ones. I found several vegan pound cake recipes online, ranging from no-fat to very-high-fat, but I wanted mine to have a healthful component, too. So, I revamped my older recipe, and used some of the same proportions as the Fine Cooking Nicole Rees recipe. For instance, the author used 1 3/4 cups of sugar to 2 1/2 cups of flour. This is actually a higher amount of sugar by weight, and she explains that this makes a more moist and tender crumb. So I took her advice, but I used 1 cup white whole wheat pastry flour, and 1 cup unbleached white flour, and I added some chickpea flour and corn flour for a more eggy, buttery taste and color, as well as more nutrition. I kept the silken tofu and egg replacer as the egg substitute. We really liked it-- it's not too sweet, not too light, but moist, and surprisingly very rich-tasting. I served this to company last night and they loved it! I froze the leftovers so that we wouldn't be tempted to eat any more for now! NOTE: if it's been a long time since you ate pound cake, remember that it isn't meant to be a light, fluffy cake. Preheat the oven to 350°F. 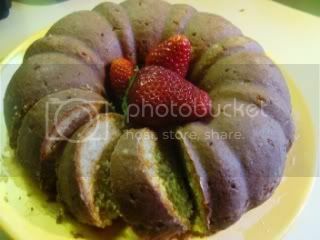 Melt 1 tablespoon buttery spread and , using a pastry brush, brush it even over the inside of a 6-cup Bundt pan. Dust evenly with flour and tap out the excess. 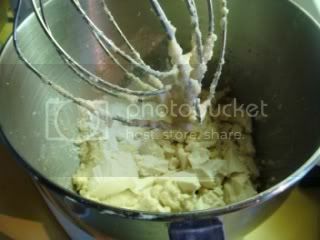 Place the olive oil, buttery spread and sugar in the bowl of a stand mixer with the whisk attachment. Beat at medium speed for 2 minutes. Stop the machine and crumble in the silken tofu. Add the egg replacer powder. 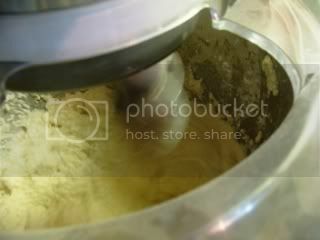 Beat at medium high speed for 2 more minutes, stopping the machine to scrape down the sides of the bowl halfway through. Whisk together the Dry Mixture ingredients in another bowl. At low speed, add half of the Dry Mixture to the sugar mixture and beat just until it is combined, stopping the machine to scrape down the sides of the bowl, if necessary. Add the lemon juice, non-dairy milk, vanilla and lemon zest and beat again just until combined. Add the remaining Dry mixture and beat at low speed just until combined. Increase speed to medium and beat for 30 seconds more. Remove the bowl from the mixer stand. If using the coconut, fold it in gently. 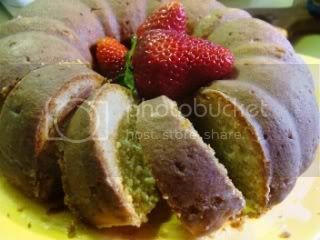 Scrape the batter evenly into the prepared bundt pan. Bake in the center of the oven for 55 minutes, or until a cake tester comes out absolutely clean (under-cooking may result in a "gummy" texture). Allow to cool in the pan, on a rack, for 10-15 minutes. Then invert on a plate, on a rack, and let cool. Do not slice the cake until it is thoroughly cooled. Whisk together the sifted powdered sugar and lemon juice. Poke holes in the cake with a skewer at intervals. Brush the glaze on all surfaces of the cake until you have used it all up. When this dries, it will create a sort of crust, which will keep the cake moist for several days. Nutrition (per serving): 246.5 calories; 32% calories from fat; 8.9g total fat; 0.0mg cholesterol; 175.3mg sodium; 182.9mg potassium; 38.3g carbohydrates; 1.6g fiber; 22.7g sugar; 36.7g net carbs; 4.0g protein; 5.3 points. IF YOU USE THE COCONUT OPTION: Nutrition (per serving): 278.3 calories; 38% calories from fat; 12.0g total fat; 0.0mg cholesterol; 177.1mg sodium; 209.1mg potassium; 39.5g carbohydrates; 2.4g fiber; 23.0g sugar; 37.0g net carbs; 4.3g protein; 6.1 points. IF YOU USE ONLY THE LEMON GLAZE OPTION: Nutrition (per serving): 277.6 calories; 28% calories from fat; 8.9g total fat; 0.0mg cholesterol; 175.3mg sodium; 186.0mg potassium; 46.4g carbohydrates; 1.7g fiber; 30.6g sugar; 44.8g net carbs; 4.0g protein; 6.0 points. IF YOU USE BOTH THE COCONUT OPTION AND THE LEMON GLAZE OPTION: Nutrition (per serving): 309.4 calories; 34% calories from fat; 12.0g total fat; 0.0mg cholesterol; 177.1mg sodium; 212.2mg potassium; 47.6g carbohydrates; 2.4g fiber; 31.0g sugar; 45.1g net carbs; 4.4g protein; 6.7 points. Yum Bryanna! Thanks for sharing the recipe. I can't wait to make it. This looks delicious, but I was wondering if you have a soy-free alternative for tofu that would still be low fat. I see tofu quite a bit in baked goods but can't have the soy. Would you just use fruit puree, or would there be a better alternative? Thanks! awesome! i loooove lemon-flavored baked goods. this seems like a really great recipe for many occasions. Alisa, I thought about that, but the protein in the tofu might be the hard thing to replicate. All I can suggest is that you experiment. You need about 1 1/2 cups of something that has a similar consistency to whipped tofu. Perhaps pureed, unseasoned white beans? Or a combination of that with flaxseed glop? This is just off the top of my head. When you substitute, you have to think of what the offending, or missing, substance contributes to the structure and taste of a recipe. I made this cake (without glaze or coconut) which was actually the first time I used a commercial egg replacer even though I've been baking vegan since 1999. I used the zest of "1 large lemon" which happened to be a very large lemon, almost the size of an orange, so the result was super lemony, but good. My guests loved it, and so did my very picky boyfriend. My guests also suggested that I decorate the cake with a lemon. I happened to have half a lemon around and jokingly placed it inside the hole in the cake. Some of the guests then got the idea of squeezing some lemon juice on the cake and claimed it was even better that way.